We are made in God's image. Not just the man. Not just the woman. 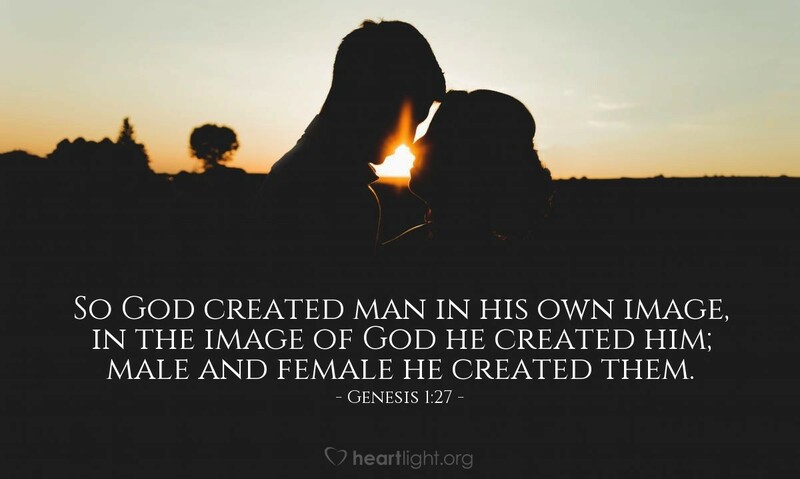 Both male and female are made in God's image! Incredibly, this is not just true before the Fall. When God made us in the womb of our mothers (Psalm 139:13-16), he made us in his image (Genesis 9:6). Because people are precious to God, because we reflect something of the character of our Creator, each person is to be valued. None is to be denigrated, belittled, or cursed (James 3:9-12). People are precious, not only to God, but also to us because in some special way they reflect his image. Almighty Creator, please help me value each person I meet today because I am consciously aware that you have individually made them to reflect your character and nature. At the same time, bless me with spiritual growth as I consciously submit myself to your Spirit as you transform me to be more like you each day. In Jesus' name I pray. Amen.